You likely don’t need another reason to quit smoking. Surely, the lung cancer, emphysema, heart problems, and other known health impacts are enough. But if they aren’t, here’s just one more good reason to quit: smoking can make it harder for you to get around. There is an interesting correlation between smoking and people who have mobility problems. A recent study from Miriam Hospital found that people who have mobility impairments and require assistance to get around smoke at a substantially higher rate than people who move freely. And not only does this segment of the population smoke more, they are also less likely to quit. One of the main reasons the research team wanted to look at people who have trouble walking without assistance (participants in the study who either used special ambulatory equipment like a cane or scooter to get around, or those who could not walk more than a quarter mile without equipment) is because smoking is known to worsen existing health conditions. 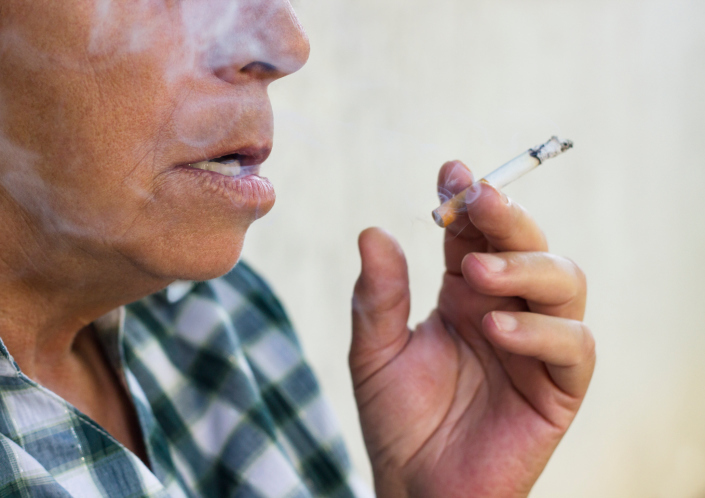 This means smoking can actually make the physical limitations already impacting these people worse, resulting in further pain, faster degeneration, and perhaps causing the onset of a number of other health problems. If you are a smoker who needs assistance to get around or you have mobility problems, I strongly suggest you try to quit smoking. Cigarette smoking is known to cause respiratory and circulatory problems, muscle weakness, and delayed wound healing, and is also known to intensify painful conditions like osteoarthritis and multiple sclerosis. These problems can increase inflammation and pain, and can speed up the degenerative process. For this particular study, researchers examined 13,308 adults with mobility impairments between the ages of 21 and 65. In the 21–44 cohort, 39.2% were smokers compared to only 21.5% of the population without mobility problems. In the 45–65 cohort, 31.2% were smokers, while only 20.7% of the general population in that age bracket lit up. Quitting smoking is difficult no matter who you are, but if you’re already facing a daily uphill climb in life, it’s even more difficult. Depression rates are higher in people with disabilities, and this likely translates into higher smoking rates. The attitude is likely, “I might as well have another cigarette; after all, how much worse can it get?” If you can’t walk and already feel you have a low quality of life, what motivation is there to quit smoking? Well, there should be plenty. I already mentioned how smoking causes a number of additional health problems and can worsen the condition for people with physical disabilities. The important thing about quitting smoking, much like accomplishing anything in life, is that you need to believe that you can. Have faith in yourself and your abilities and positive action should follow. Borrelli, B., et al., “Cigarette Smoking Among Adults With Mobility Impairments: A US Population-Based Survey,” American Journal of Public Health July 2014; doi: 10.2105/AJPH.2013.301772.